Well friends, the party season is almost upon us. Oh hell, it’s upon us every week, let’s face it. 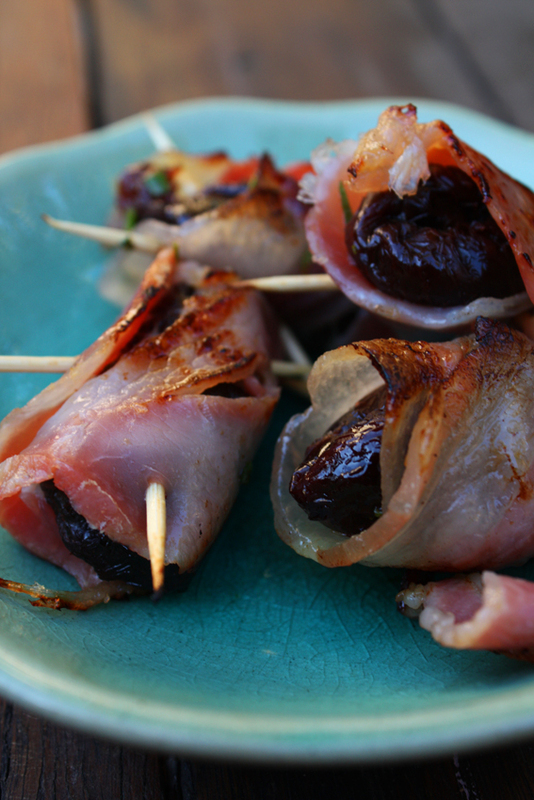 I just said that as an excuse for talking about one of my favourite nibbles, the devil on horseback. I had a big fad with these a couple of years ago, and then forgot about them until the amazing Jules served them at her place the other week, and now I’m all agog again at how good they are and have made them several times since. For those whose parents never served these as snacks at classy ’70s progressive dinners (now there’s a whole other topic for a post …), or who have not otherwise discovered the delights of this little torpedo of salty sweetness, a devil on horseback is basically a prune wrapped in bacon, skewered with a toothpick and then grilled, barbecued or otherwise lightly frazzled. Put like that, of course, it sounds – well, silly. But believe you me, Kimmy, we are talking seriously good finger food here. The laziest, most cursory bit of online research reveals little about the ridiculous name, except that it’s a cheaper version of angels on horseback – a fresh oyster wrapped in bacon and then grilled (which I’ve never tried – sounds slippery, but really must give it a go), and this was apparently first documented in Mrs Beeton’s Book of Household Management in 1888, derived from the French dish anges à cheval. All of this explains nothing about horses and angels. I think the horse is the bacon, and the devil (being black, I suppose??? sheesh) is the prune. Go figure. Told you it was nuts. Anyhoo – enough with the dodgy historical nomenclature, and on with the recipes. Jules’ absolutely delicious version, and my copies pictured here, were the updated groovified kind made by your friend and mine Maggie Beer, and the recipe is here. Of course it involves verjuice, and orange zest, and rosemary. These are good, as the verjuice plumps up the prune and gives it a succulence it otherwise can lack, and the orange zest provides some zip in what can be a cloying sort of flavour combo. I did mine with some pancetta I had in the fridge, but Maggie says speck or bacon. My other fave comes from Margaret Fulton’s Encyclopaedia of Food and Cookery, and is a rather boofier version, direct from the seventies. If you are delicate about salt, stop here, turn around, and take refuge. But if like a true howtoshuckanoysterlover you feel the force strong within you, proceed! 1. First, take one blanched almond. 2. Wrap that little baby in an anchovy, and pop the swaddled nut into the hollow centre of a pitted prune. 3. Wrap in bacon, secure with toothpick and proceed to bung in the oven / stick on the barbecue / in a non-stick frypan, etc. Repeat procedure for as long as you and your guests can take it. These are so rich and salty you can really only eat about two, although Senor has been known to clear a plate without once gasping for water. Jules and I have discussed possible variations; perhaps a caperberry in place of an anchovy? A teeny smidge of chilli? Please do have an experimental go – and if you come up with your own variations, tell us all about it. May the devilish force be with you. Inspired by the happy coincidence of my friend Ms Melba’s recent gift of her incredibly good homemade labneh – that creamy, unbelievably smooth yoghurt cheese – and Miss J’s birthday gift of the gorgeous Saha: A chef’s Journey through Lebanon & Syria by Greg & Lucy Malouf, I decided on the weekend to have a stab at making some labneh myself. Oh, and the third inspiration was driving past a humungous and ghastly Spotlight outlet, whereupon I could dive in and grab myself a thousand metres of muslin (I later sent some of that Ms Melba’s way, and she said that while she longed to drape it about her person for running through damp fields towards Pemberley, she promised to use it for cheese-related purposes). Labneh, it turns out, is so easy peasy to make that I am never again buying that gorgeously silky Yarra Valley Dairy Persian Fetta in the black tin, because my labneh (while texturally probably quite different and probably-not-even-remotely-comparable-because-it-isn’t-feta), turns out to be just as delicious. And costs very little. The amazing thing about this stuff is the texture – so silky and creamy, but with excellent body and, depending on your marinade, a lovely soft and herby tang. Greg Malouf’s recipe is here, and it’s the one I used, except I followed Melba’s lead and formed it into the little balls rather than just spreading over a plate topped with oil as he’s done. Anyway it’s hardly a recipe at all really – take a kilo of natural yoghurt, hang it for 48-72 hours, and then do as you wish with it. Melba hangs hers for anything from three hours to overnight, and it’s beautifully light. I did as GM says though, and hung it for 48 hours. The longer you hang it, the firmer it gets, and lots of whey comes out of it. Here’s what I did. 1. Take a good half-metre of clean muslin and line a colander with it over a bowl. A fine cotton tea towel would probably do just as well, but perhaps take longer. 2. Mix up a kilo of full-cream natural Greek-style yoghurt with a good teaspoon of salt and pour it into the muslin. 3. Tie up the corners of the muslin any old how, and find a way to hang it. Easiest for us was get a large deep saucepan, tie the muslin bag to a long wooden spoon and rest the spoon over the top of the pot. Do tie it tight and hang as high as possible, as it does hang lower over the hours and ours eventually touched the bottom of the pot, necessitating re-tying half-way through. No big deal though and gave us a chance to drain the whey out halfway through. 4. Bung it in the fridge for anything from three hours to 72 hours. 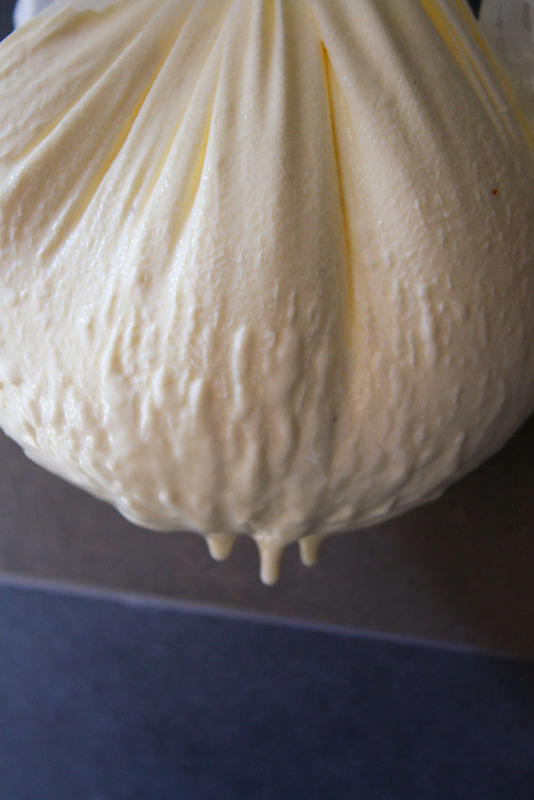 We did 48 and it resulted in easy-to-form, nice firm labneh. 5. 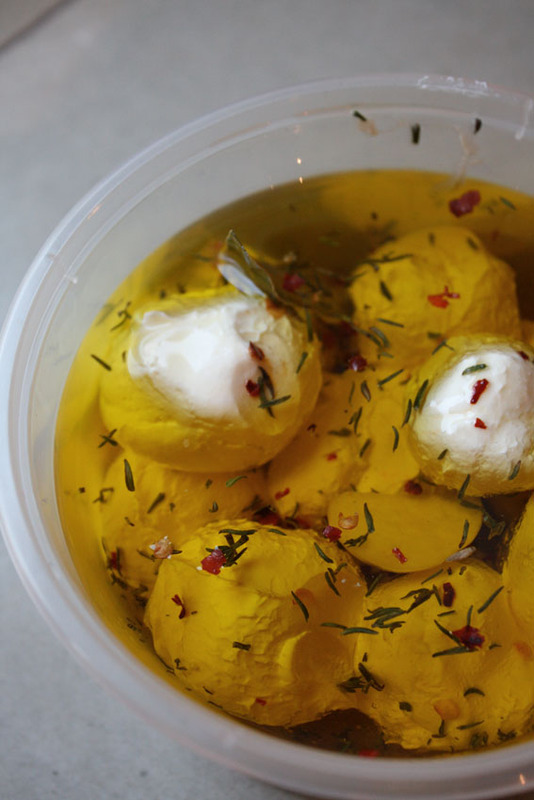 Remove and form into balls, keeping your hands moistened with olive oil – stops the labneh sticking to your hands and the balls to each other. 6. Lay the balls in a jar or container, cover with oil and add some dried chilli flakes, dried thyme, fresh rosemary and a clove of garlic. Any dried herbs or spices you fancy would do, I reckon. Use it spread on biccies as a dip; on toast or a sandwich instead of butter; plonk a ball in your spicy veg soup (that’s where almost all of M’s batch went – thicker and more delicious than a yoghurt dollop); toss on to steamed green vegetables, or just use anywhere you would sling a blob of yoghurt, I reckon. This amount made three full medium-sized deli takeaway containers’ worth. The oil is obviously the costly bit of this, but given that one would never chuck away such lovely herby olive oil, instead keeping it for pasta sauces, salad dressings or whatever, I reckon this recipe is a contender for the frugal food post as well as just being a beautiful thing. And great to take to a friend’s when you’re turning up for dinner – they will be tres impressed with your domestic goddessness as well as gobbling it up in a flash like I did. Finger food fiasco - the kind of creation that ends with an olive in the cleavage (& a toothpick in the chef's eye). Note to party caterers: when finger food can’t be eaten with the fingers, it’s not finger food. Very enjoyable couple of hours at the A&U publishing party the other night, at which NSW Premier Nathan Rees gave a short and very welcome speech about his support for territorial copyright and opposition to parallel importation of books, and then enthusiastically nattered to writers. Imagine – a politician who likes to speak publicly about how much he enjoys fiction, and then wants to talk at length to the kinds of people who write it. All a bit of a shock. Anyhoo, twas a great party all round, except the finger food was rather too frequently impossible to eat with the fingers – so that when a young woman appeared with a huge tray of food, a gaggle of starving people gathered round her and stared down at this big platter of something scattered with a wet-looking salad and what appeared to be lentils. Then everyone simply looked confused, then disappointed, said ‘ah, no thanks’ and stuck their noses back in their glasses. It was the image of how one should eat it that put one off: just scoop up the bits in two hands, perhaps? Or tilt one’s face to the platter and bite it off the surface, like bobbing for apples? Bizarre. Then there is the mix-of-things-on-an-Asian-flat-spoon approach, which I have no qualms about, provided the mound of stuff is able to be got into the gob in one go. Having a big gob, I managed better than many more delicate guests who nibbled round the edges of a high pyramid of squiddy-salady stuff, neck extended turtle-style to avoid getting food on themselves when bits of it inevitably began falling. Read the rest of this entry ? You are currently browsing the archives for the finger food category.